Keeping granola in snack size bags makes it convenient to grab on-the-go or when you are busy and don’t have time to prepare a snack. But normally granola is not Paleo because of the oats and when you buy it in the store it’s full of all sorts of questionable ingredients. So I experimented with some Paleo granola ingredients and came up with this delicious recipe. I still remember the first time my oldest daughter tried mango. She was about two years old and we were at my brother-in-law’s cabin in Island Park, Idaho. They had some sort of cool contraption that took the pit out nice and easy and she was fascinated by that and by the mango. I swear she ate five in one day. Oh, good times! The coconut oil, mango, and coconut flakes really give it a nice, tropical flavor and the chili powder really accents that as well. 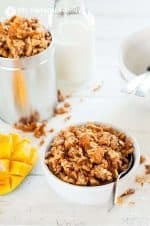 This is a versatile grain-free granola recipe where you can add other ingredients you think would be good in it and take one or two out that you don’t like as much to make it customized for you! Is Paleo granola good for you? Paleo granola does not have oats in it because they aren’t Paleo. So it can be good for you, but if it has a lot of added sugar such as honey or maple syrup, that helps make it not so healthy. 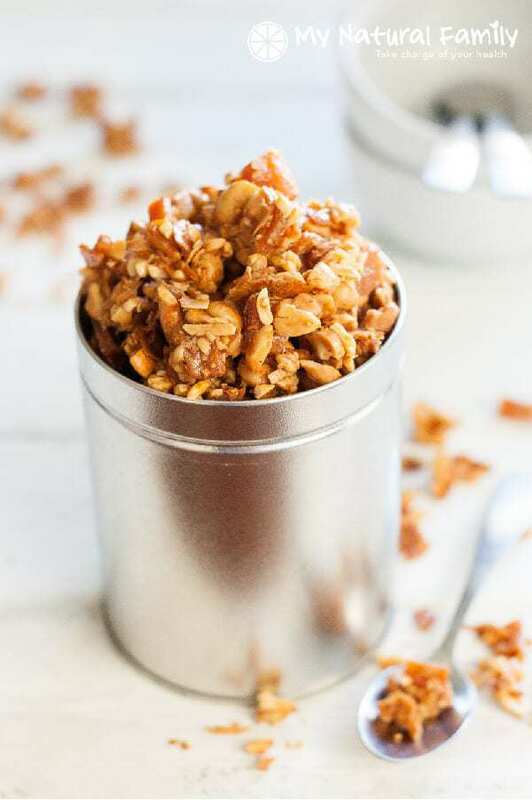 This granola recipe below doesn’t have very much honey in it so it’s rather healthy. What cereal can I eat on Paleo? 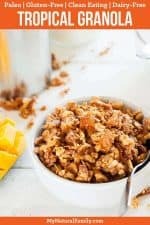 I have a blog post with 25 of the Best Paleo Cereal Recipes for Your Paleo Breakfast it has 25 recipes for common cereals you can make yourself that aren’t a lot of work. Some of them are copycat recipes for commonly known cereals you can buy off the shelf in stores. 9 of The Best Paleo Granola Bars to Make Ahead and Grab recipes I have compiled together for your benefit. Are oats on the Paleo diet? Oats are not Paleo because they contain anti-nutrients that cause inflammation, contribute to leaky gut, trigger autoimmune disease and weaken the immune system. Oats are often packaged in facilities that package products which contain wheat so they are often contaminated with slight amounts of wheat and should be avoided. Is popcorn allowed on Paleo diet? Popcorn is not Paleo but if you don’t follow a real strict Paleo diet and you want to “cheat” once in awhile popcorn isn’t the worst snack you could choose. Words of caution though: NEVER eat microwaved popcorn in the packets. Make your own and pop it in coconut oil or use an air popper. Put coconut oil or real butter on it, not soy oil. In a large mixing bowl, toss together the macadamia nuts, almonds, cashews, mango, and coconut. Place half of the mixture in a food processor and pulse several times until about 1/2 of the mixture is broken down into smaller pieces. Add the mixture back into the mixing bowl and toss again. In another small bowl, whisk together the coconut oil?, honey, egg white, cinnamon, chili powder, salt and vanilla. Pour over the nut mixture and stir until well coated. Spread the mixture in a single layer on top of a parchment or non-stick mat lined baking sheet. Bake in the preheated oven for 1 1/2 hours. Watch closely in the last 15 minutes of baking to make sure they do not darken too much. Remove when the granola is golden brown. 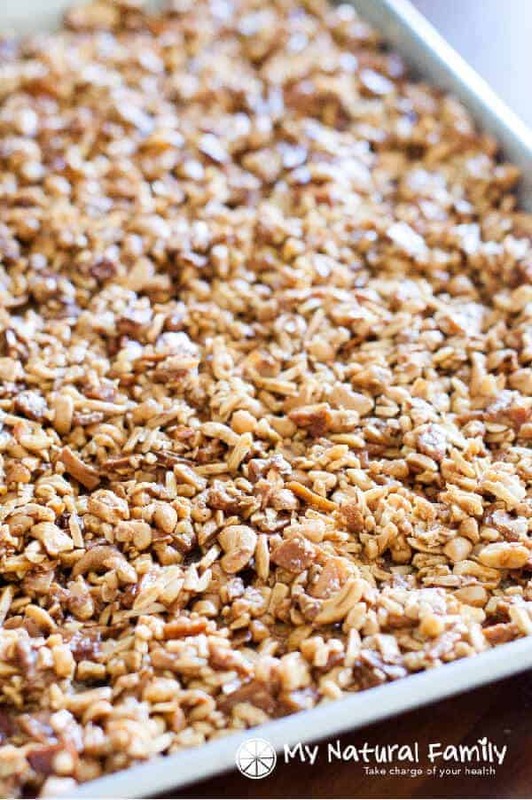 Let granola sit on the baking sheet until fully cooled. Break up into pieces and store in an airtight container. Love this! Perfect for an after school snack! This granola looks amazing! Would be a great breaky treat this holiday season. I can see this in small jars as gifts from the family.